I drew my curtains opened this morning, and there it was. Resting on my air-con ledge. Looks like he's standing guard -- protecting you (or your air-con!). Happy WW. Amazing that he didn't fly away! Great picture! If I didn't know better, I'd swear he's posing! Great photo. Hope you have a wonderful WW! He's hungry. Do you feed him? Happy WW! You come to Houston and I'll furnish the stool! Great job getting that shot before he flew off. Happy WW, thanks for stopping by. That was a good shot! Cute dove. Symbolizes peace. You're living in the east of Singapore. Near Kew Drive? There are lots of irritating, dirty pigeons and crows out here. Thanks for informing me about the problem on my site. I know the problem but don't know how to solve it. I'm an IT idiot. I'll try again. nice shot! 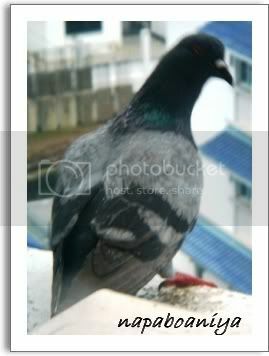 they are quite frisky and i have difficulty taking pigeon shots with my point and shoot camera! You're lucky to have it that close. Happy WW. They are quick little creature and I have yet to make a good shot at them. Very interesting! That's a unique perspective! Yes, those wrestle with daddy games usually end with someone crying. I guess it's worth it. Nice shot here:)My Wordless pic is up as well;-) Happy WW! I hope your visitor didn't leave you a nice mess! Nice shot. Hope he didn't leave any nasty surprises for you, LOL. Happy WW! At least it wasn't sitting on your kitchen counter - And at least I don't still live next to the people who raised pigeons in their backyard as FOOD! I can actually hear it coo-ing... and I am amazed that the pigeon stayed until you could grab the camera and take a picture... well done! I'm surprised it didn't fly away, nap! brilliant choice for today's wordless! thanks for stopping by my blog. I appreciate your kind commnets! I also had a NICU baby - and I can so relate to your previous post. Will be stoppingin lots now that we have "met" in blog world! hehe my husband always calls them rats with wings. Awesome shot! From behind, your visitor looks like a college professor in his robe! What a nice shot- beautiful bird! thanks for visiting my blog too. Happy WW and sorry I'm late! If you are interested, I started a new meme you might like. I'm sure he was a welcome visitor.